Utilising the very latest technology and industry leading expertise, Blackboots and Wheels in Motion offer you the very finest service for wheel alignment and geometry. 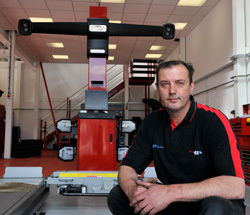 Led by Tony Bones, one of the UK's leading authorities on wheel alignment, with years of experience on race car setups, your car is ensured the very best possible attention, to aid better performance, drive quality and tyre longevity. Our state of the art equipment includes the Hunter Hawkeye 811 Pro Wheel Aligner. This stunning piece of machinery gives Tony and his team a precise indication of the state of the wheel alignment and allows them to make the most precision changes to the geometry of your car. To find out more about the technology behind wheel alignment and an insight into Tony's expertise we have a number of pages of information produced by Tony within the Technical Theory section of our website.